Squirrel’s owners came into the Bracebridge Animal Hospital with their dog for an examination and consultation. They had been finding a reddish discharge on the dog’s bed intermittently for a few weeks. The physical examination, urinalysis, and blood testing all revealed a very healthy canine. The owners went home with their healthy dog, perplexed. They continued to find the reddish discharge on the dog’s bed. The owners eventually came back to the Bracebridge Animal Hospital with their cat “Squirrel” in tow. However this time, through physical examination, urinalysis, and blood testing it was discovered that Squirrel had a severe cystitis. An inflammation of the bladder causing bleeding. Further testing revealed that the cat’s cystitis was not caused by an infection, the urine culture grew no bacteria. 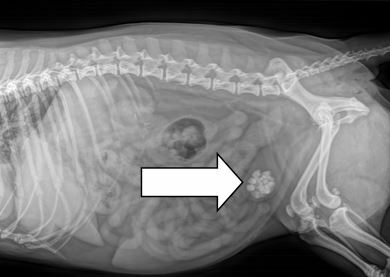 Radiographs showed the cause of the cat’s discomfort was a large bladder stone. Squirrel was placed on a prescription diet designed to dissolve bladder stones. Luckily she liked the flavour of the food and ate it readily. Six weeks later, the owners were no longer finding the red discharge on the dog’s bed and Squirrel was bright and active again. Repeat radiographs showed that the bladder stone was gone! Squirrel was lucky to have had a struvite stone – the type that responds to dietary dissolution, however other types of stones exist, namely calcium oxalate stones that unfortunately require surgery to remove. Remember to feed a veterinary recommended diet to help your pet avoid developing bladder stones.